Daddy's Blind Ambition: Would a sign make you slow down? Would a sign make you slow down? We might live in suburbia, but in order to get to one of his preferred running routes, Matt has to cross a horrible intersection. Two major roads intersect and Matt has to cross both. I worry every time he walks out the door. Disclaimer: I’m a worrier by nature (remember the fire hydrant story?). I make him run with a phone now, which he complains about because it weighs him down or might get wet or lost or some other possibly bad thing. But, it makes me feel better so he takes it with him. The road has walk lights (but they don’t make a sound to indicate it is safe to walk) and they stop for a reasonable amount of time, but the problem is, cars that are turning right don’t seem to care that a runner (or anyone for that matter) might be crossing the road at a speed less than a car in a hurry to get somewhere. I’ve nearly gotten hit twice and the only reason I didn’t is that I could see a car hurling towards me going way over the posted 40 MPH speed limit. Matt wouldn’t see that car. I know the phone won’t stop him from getting hit, but it makes me feel a little better knowing that he or someone will be able to call me. I always make him tell me exactly where he is going and when he will get back. Over the years he has learned to add a buffer (don’t think I haven’t figured this out, Matt!) so that I don’t start calling him two minutes after he said he would back only to find out he needed to take a stop for a drink of water or a bathroom. I hope to never write about how he called me because something happened at this intersection. I know bad drivers aren’t a problem for visually impaired runners alone, but it certainly is more of a problem and it scares me. 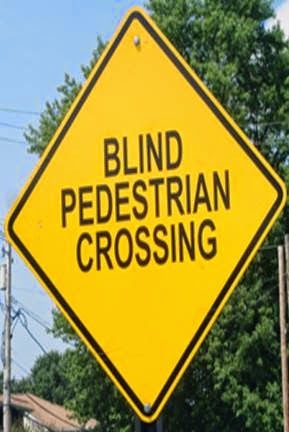 I sometimes wonder if the “Blind Pedestrian” signs do anything. I suggested to Matt that we see about having one added to the intersection near our house, but he is opposed. Instead, I’ll continue to worry every time he goes for a run until he walks back through the door.